As you saw in the previous tutorial, it is quite easy to add friends on Facebook by sending friend requests to the person in question. But what if you want to cancel a friend request? In other words, can you unsend requests that have already been sent? The answer is yes and no: while you cannot literally recall and unsend a request, you can cancel that request by using an indirect way. This will work 100% of the time, and the other Facebook user will never know that you sent him or her a request and then change your mind. And you will still be able to re-send that friend request later on if you so desire. First, if needed, login to your Facebook account. Once you are signed in, find the Facebook user to whom you sent that request you want to recall. Click on that person's profile, and scroll to the bottom of the page. You will see on the left a link that reads "Report / Block this person" - click on it. As soon as you do, Facebook will open a popup dialog that looks like the screenshot below, and allows you to block a Facebook user. 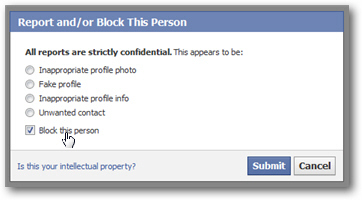 All you need to do is check the "Block this person" checkbox and click on the "Submit" button. And this is how easily you can cancel friend requests on Facebook, without actually having to manually unsend the friendship request. If you plan on perhaps becoming friends with that person in the future, we recommend that you unblock them right away, before you forget about the block: see how to unblock users on Facebook. Tip: there is one case in which you will not be able to delete a friend request you sent to a particular Facebook user - this is when you block that person after they have already seen the friendship request. Obviously, whether they have chosen to accept it or reject it, the desired effect of unsending the request will be void. So make sure to withdraw friend requests quickly!